Electrical and Computer Engineering at Michigan has launched the ECE Innovator Program (ECE IP), which is aimed at inspiring and facilitating the commercialization of research conducted in ECE. The program will provide financial support to a team of entrepreneurs with both technical and product management skills. The program acknowledges ECE as a hub of top-notch research and innovation that has led to significant commercialization of the intellectual property generated by its faculty and students. The ECE Innovator Program is made possible through a donation by ECE alumnus and serial entrepreneur Rick Bolander, Managing Director and co-founder of Gabriel Venture Partners and eLab Ventures. ECE has matched Bolander's donation to launch the program. In its first year, 9 potential or young startup companies participated in the ECE IP. Three programs were open to all prospective entrepreneurs and focused on prototype development, licensing, and customer identification. 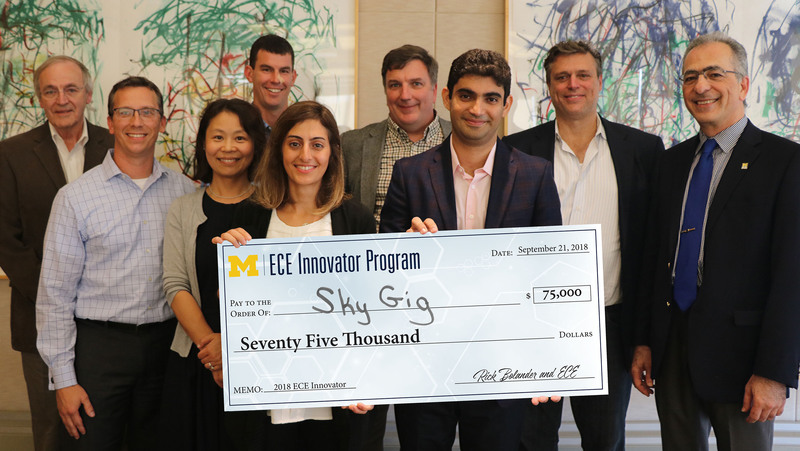 The winning team, called SkyGig, plans to develop transformative technology to allow society to take full advantage of 5G, the fifth generation of cellular mobile communications.